Mahindra showcased the e-Verito at the Delhi Auto Expo earlier this year after presenting the concept version at the 2014 expo. As the name suggests, the car is based on Mahindra’s slow-selling Verito sedan that is otherwise offered with a 1.5-litre diesel engine. Like the e2o, the e-Verito runs on electricity alone. It is powered by a three-phase 72V electric motor that produces 41PS of power and 91Nm of torque. Charging the battery from 0 to 100 per cent takes around eight hours, so this isn't for the impatient. However, if you opt for the D6 variant with the 'fast charge' feature, you can get the e-Verito up to an 80 per cent charge in one hour and forty-five minutes. The model has a claimed range of 110km (e2o = 120km), with the top speed rated at a modest 86 kmph. The car will be sold in key markets such as Delhi, Mumbai, Bangalore, Pune, Kolkata, Chandigarh, Hyderabad, Jaipur and Nagpur. The e-Verito is unlikely to be a great seller, but the fact that it is a four-door sedan will enhance its appeal, given the added practicality it offers over the e2o hatchback. 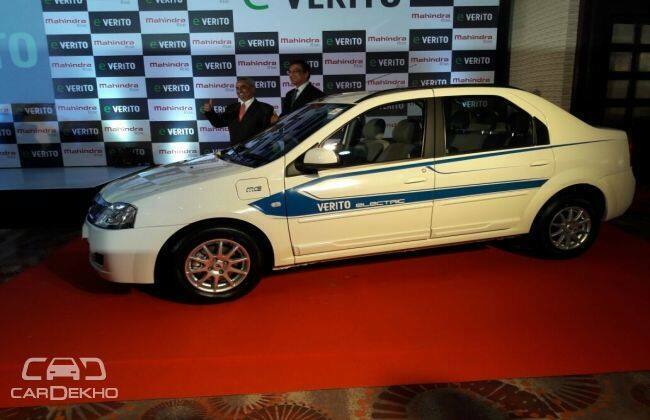 Do you think the e-Verito will be a better seller than the e2o in India? Would you consider buying an affordable electric car? Share your thoughts with us in the comments!